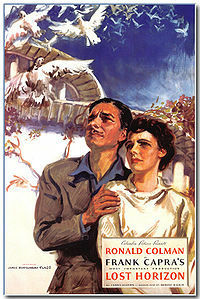 Lost Horizon is a 1937 film directed by Frank Capra starring Ronald Colman, Jane Wyatt and Sam Jaffe. It tells the story of a group of travelers who find a utopian society in the Himalaya Mountains. The film is based upon the James Hilton novel of the same name and was adapted by Sidney Buchman (uncredited) and Robert Riskin. The Streamline Moderne sets were designed by Stephen Goosson. Artistically, Lost Horizon evokes many of the themes associated with Capra as an auteur but is somewhat darker and at times, cynical, as with much of his early work. It was remade as a 1973 musical, which was a notorious critical and commercial failure.